Healthy sense of guilt help us to reflect on our mistakes. We could then rectify it and move on in life. Unhealthy guilt or excessive guilt could wreck our emotions leading to excessive self blame, painful regrets or even severe depressive state! Many a times, the feelings of guilt is so strong and overwhelming even though there is no evidence of wrong doing !! This is called irrational or illogical guilt. Some of us may have certain temperament or higher tendency to feel guilty. It may be due to a harsh self-critical tendency or high expectations of self. It could be due to difficult childhood experiences. However, the absence of guilt feelings may spell danger too. It may result in extreme self-righteousness or self- justification with no regards for what is right or wrong! 1) Seek and understand the Truth about what is right and wrong. 2) Understand that none of us is perfect. We all make mistakes and learn from it daily. 3) Knowing that we only need to do the right thing and not to please anyone’s expectations. 4) Knowing that we just need to try. And do what we CAN DO. Not what we cannot do. 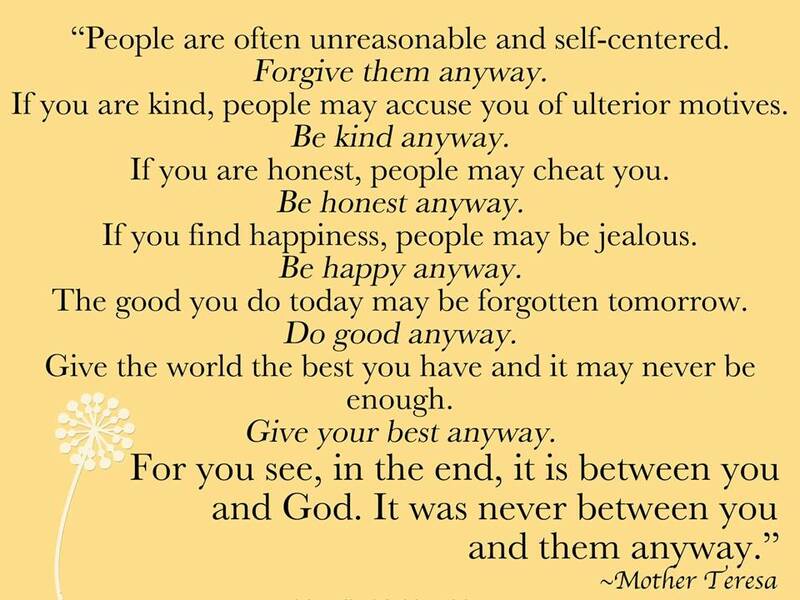 So folks, I shall leave you with my favourite quote by Mother Teresa.